AP Postal Circle - Sports Quota Posts Recruitment / AP Postal Circle Postman, Postal Assistants, Sorting Assistants, Multi Tasking Staff 2018 Recruitment. Department of Posts, Office of the Chief Postmaster General , Andhra Pradesh Postal Circle , Vijayawada has issued various posts recruitment notification and the Department of Posts invites applications from the eligible and interested Candidates to fill up Postman, Postal Assistants, Sorting Assistants, Multi Tasking Staff Vacancies of the year 2018 in Andhra Pradesh Postal circle, Vijayawada. Applications are invited from meritorious Sportspersons in the following disciplines for appointment as Postal Assistant/ Sorting Assistant, Postal Assistant (CO/ RO), Postman and Multi Tasking Staff, under sports quota. 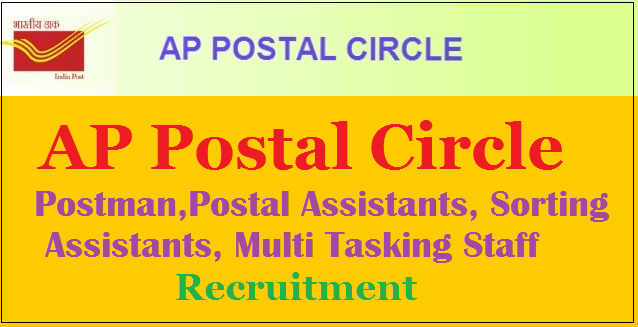 The applications for post of Postal Assistant, Postman, Multi Tasking Staff are vacant in the Andhra Pradesh Postal Circle. All the experienced aspirants can apply for the post. Applicants with 10th pass degree can apply for the posts. The students will be given a good salary and the qualified aspirants will be given first preference in the selection. Andhra Pradesh Postal Circle has issued a latest notification for the recruitment of 36 posts. The service is Postal Assistant/Sorting Assistant/Postal Assistant, Postman & MTS for Sport person in Postal Divisions, RMS Divisions in Andhra Pradesh Circle. If you want to make career at AP Postal Circle Vacancy then you can apply in prescribed application format on or before 30 January 2018. It is golden opportunity for interested candidates, who are seeking government job in AP Postal Circle Vacancy. Further other details are given below. Postal Assistant/Sorting Assistant/Postal Assistant, Postman & MTS. Qualification: 10+2 Standard/ 12th class. Typing knowledge and computer knowledge. Sports qualification. Qualification: Matriculation with Sports qualification. Qualification: Matriculation/ ITI with Sports qualification. How to Apply: The interested applicants can apply for the post from official website https://www.indiapost.gov.in/ and submit it. For further details, visit the official website. Completed application forms should be sent to The Chief Postmaster General (Recruitment Section), Andhra Pradesh Circle, Krishnalanka, Vijayawada. Last date for receipt of applications: 30.01.2018.